One of the cool things about Bratislava is that it's close to a lot of great cities, like Prague, Budapest, and Vienna. Bratislava is a bit on the small side, so it's nice to be close to larger cities like Vienna, which makes up for some of the things that Bratislava sometimes lacks (like greater ethnic diversity, record stores, world class art galleries and museums, bountiful farmer's markets with more exotic produce, massive gothic cathedrals, etc.). We've gone to Vienna a couple times over the past month or so. It takes less than an hour to get there by train, and round-trip tickets are totally affordable, *and* for a few extra euros, train tickets include tram fare for getting from Vienna's train station to the center of town and back. That is a cool deal! With Vienna and Bratislava being so close to each other, the two cities have worked to make getting to and from as easy as possible. You can also get there by bus as well as a (very pricey) boat ride on the Danube. And a funny anecdote on that last option: several years ago, Terezia took this boat to Vienna and back. At the dock in Bratislava were brochures for Vienna for all of the museums, galleries, operas, symphonies, and other cultural happenings that are everywhere in that city. But at the dock in Vienna on the way back, Terezia saw that the brochures for Bratislava focused only on the clubs and nightlife, with photos of stereotypically hot, scantily clad, Slovak women. Poor Bratislava! I've been a little ambivalent toward Vienna, but I'm growing to like it more with each visit. I'm probably never going to like it quite as much as Florence, Paris, or Prague, but it's still an attractive and fascinating city, and I can see how it would be a nice place to live. Culturally, it's got everything you'd want out of a big, metropolitan area, and it has a comfortable, fairly laid back vibe. There's a good modern art museum; the massive Kunsthistoriches contains some priceless Renaissance paintings by Caravaggio, Titian, and Bruegel; there's a lot of great art nouveau and liberty style architecture throughout the city; there are a slew of atmospheric (albeit pricey) cafes; the sprawling, outdoor Naschmarkt has a great assortment of produce, meat, and asian food stuffs (and I've bought some AMAZING medjool dates here); and you can find some really good restaurants (with cheap lunch specials) if you know where to look. Vienna also has a few good record stores that are worth a peak (I've only found one in Bratislava), as well as way more melodramatically posed caryatids and telamones. 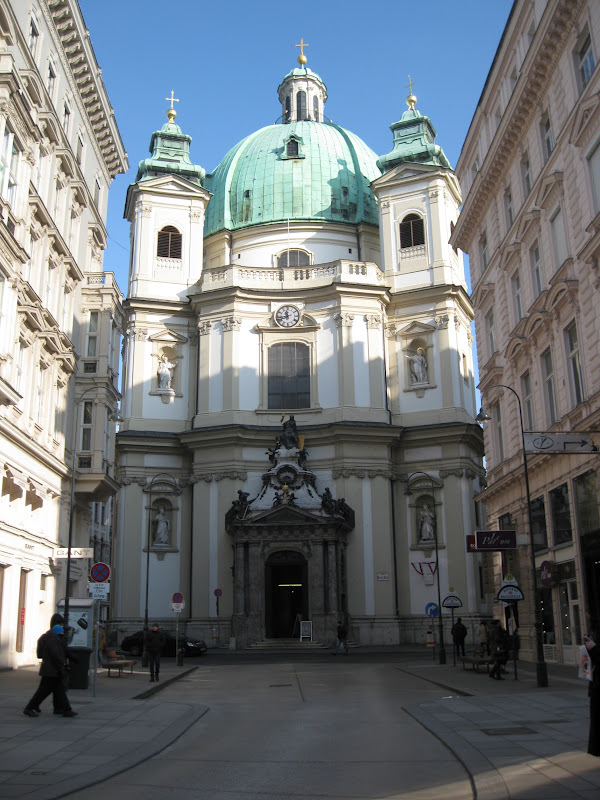 One of Vienna's problems is the Kamtner Strasse, the major artery that runs from the opera to the awesomely stunning St. Stephan's cathedral. For many people, this is the gateway into the historical center, and sadly, the strip is basically a tacky, flashy, clogged, upscale outdoor shopping mall. Beautiful, grand 18th-19th century facades are littered with signage from upscale to mid-level shops. 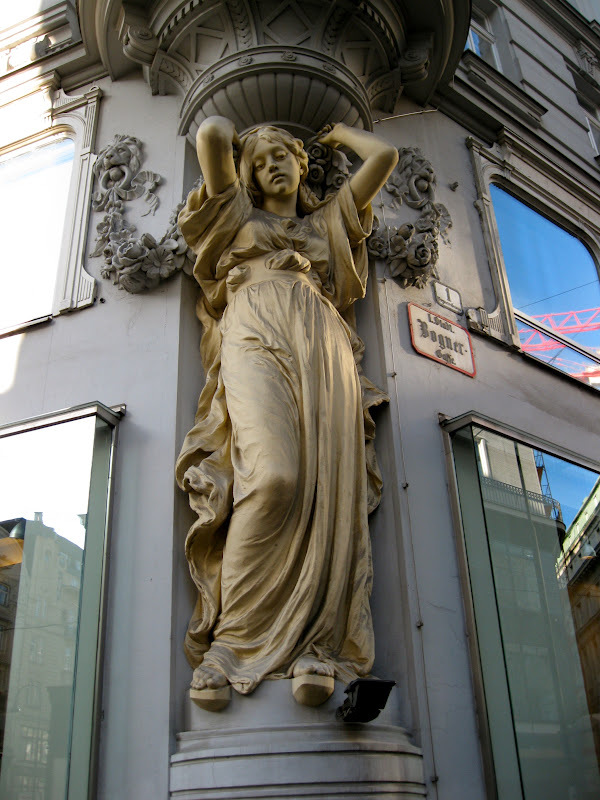 The Kamtner Strasse was my first experience in Vienna after getting off the tram, and I found it truly off-putting. My first thought was that it looked and felt an awful lot like San Francisco's Union Square. But at least now we know to take the quiet, narrow, atmospheric side streets and avoid Kamtner Strasse when wandering through the historical center. Another issue is that Vienna was hit pretty hard in WWII. I'm not sure if that's what obliterated a lot of the medieval-era architecture, or if that occurred during urban "improvements" in previous centuries, but you see far fewer medieval-era structures here than in, say, Prague or Florence. This also means that Vienna's historical center is squeaky clean, as many of its facades were restored or rebuilt post-WWII. As a result, the historical center lacks the grit and the wear of places like Florence or Paris, and even parts of Bratislava. It all feels a little too clean and upscale. You don't see any of that exposed stonework or missing chunks of plaster. Of course when you head to Vienna's outer rings, into the real Vienna, things get a little grittier, which is nice. But I find when wandering Vienna's streets that, as beautiful as they are, I'm not quite as awed as I am when tromping around a place like Florence; I don't reach quite as often for my camera. My favorite Italian cities just have this particular vibe, this atmosphere that's more appealing: the narrow, winding, cobble-stoned lanes; the grit and the grime and the cracks; the old rustic medieval stonework; the old and worn steps; the vespas noisily buzzing through the streets; the vibrant energy of its people, etc. And let's not forget that Bratislava has plenty of rough-edged charm with places like Kapituska ulica, and its myriad old palaces on Stefanikova and elsewhere. Vienna, by contrast, seems a tad too clean, polite, and genteel. A little too bourgeois. But at the end of the day, Vienna is still a fascinating and beautiful place to visit. With so much cultural stuff going for it, I'm glad it's so close to where we live, and I look forward to exploring it a lot more. 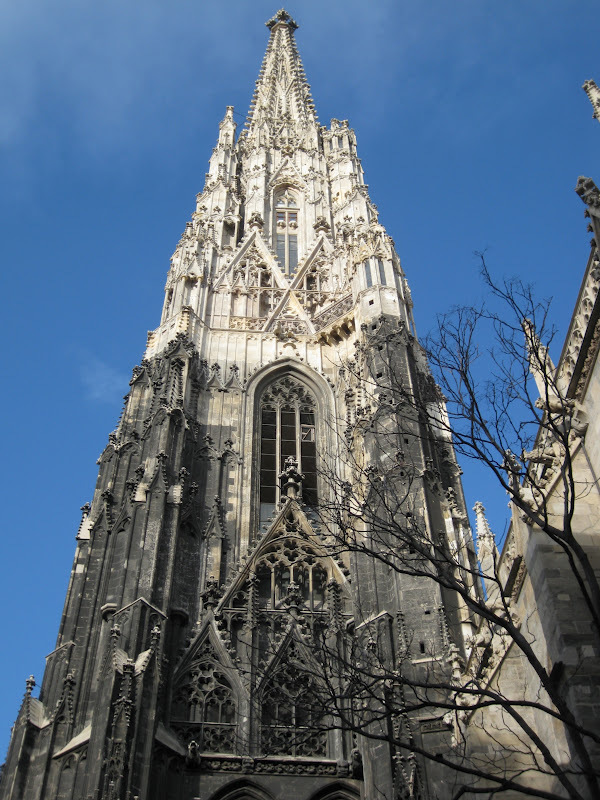 (Click here to see more photos of Vienna).